Live dealer casino games have been available for a few years and have become extremely popular with professional table game players and beginners. This is due to the amazing range of features available and the fairness of these games. Live dealer games started off with all the most popular games such as Blackjack and Roulette, but today, a much bigger selection can be accessed, which includes casino Poker, Baccarat, live Keno, and many other games. Online casinos created this variation of table games to provide players with a fair and more enjoyable opportunity. Virtual table games have always been seen as offering unfair odds, even though this has never been proved. However, with the live dealer gaming option where players get to see the dealer and the entire game, the same opportunity is presented as found in land-based casinos. This not only makes it a lot more fun but also gives professionals everything they need to take full advantage of the possible winnings. Here we look at everything live dealer games has to offer, including how they work and each gaming option. Since various developers offer these games, you will find different themes, layouts and betting options are presented. Many online casinos feature more than one live dealer platform, which gives players more choices and games to choose from. Which Live Casino is best? There are certainly some good options available if you prefer playing Live Dealer Casino Games. Below is a list of our current favorites. These casinos provide a good selection of different Live Dealer Casino Games. There are some developers that provide fewer games than others, but most include the most popular such as Roulette and Blackjack. However, to get the full gaming experience, you need to know what games are available and how they work. Roulette is offered in the European variant, which includes a single zero, 36 other numbers, and various outside betting options. Developers have created different styles and game option with these, which includes having access to detailed stats, having multiple camera angles for the best possible view, and virtual betting on the table. Blackjack is featured with its standard rules on live dealer games and provides a fair and enjoyable gaming opportunity for all players to enjoy. You will be able to see the dealer and all the cards dealt on the table, and your options are offered in a virtual way with buttons on your screen. The game can be accessed as a single hand variant as well as common draw, which is a great place for beginners to learn the game. Baccarat provides a professional gaming platform and various bet options, which features a great opportunity for players to apply strategies. The live dealer variant of the game is played with standard rules, and some also provide side bet options such as Super 6 and Perfect Pairs. Casino Poker is an exciting live dealer game that provides all the rules and options of Casino Hold’em. Each round offers you the options to fold or call, depending on your hand. Players can select various bet values and access additional side bet options with some developers. Live dealer Keno is offered much like Bingo is land-based halls. You will find the live presenter on your screen where numbers are drawn. Players can purchase tickets of various values and reward opportunities and receive winnings with an exciting live dealer game opportunity that provides constant games. 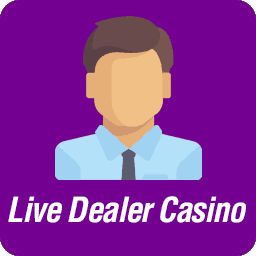 Live dealer games are presented in privately owned studios that have various land-based casino tables of all the games they provide. These tables have cameras pointed at them, which shares the game to the internet. Players can then join the game to see the dealer and the entire table. Betting can take place in various ways, which includes betting on the actual table that has been designed with a virtual skin and others provide virtual betting, which pops up at the bottom of your screen. The virtual betting option is popular with games such as Roulette as it makes it easier for players to place their chips in the right position. Since these games provide multiple players at a time, you will find each betting round is timed, much like land-based games. Most variations will offer 60 seconds for betting, which allows you more than enough time to place a bet. Re-bet options are also featured, which makes it easy to play strategies. Some have also included a double-up feature along with many other options to ensure you have the best possible gaming opportunity. All the bets and winnings are done virtually, meaning the casino will add your winning to your account and the dealer has nothing to do with it. This makes it a lot faster when winnings are owed as you don’t need to wait for the dealer to pay all the winners after each round. This also makes betting a lot easier as you can simply click on the chips shown at the bottom of the screen and place them on the table by clicking on the spots where you would like to bet. The table limits have also been increased on these games, which are much higher than you would find at a land-based casino. However, at the same time, these games also offer much lower betting options than land-based casinos. This includes not having higher bet requirements on certain positions of a Roulette table, meaning you can wager the minimum bet on a side bet that pays even money. Most land-based casinos require a higher bet on these positions as players use these with progressive betting options. In all honesty, online live dealer casinos are way ahead of regular casinos as they have included all the right options and features for players to take advantage of while also making it a lot easier to access the most popular games. There are various benefits to joining an online live dealer casino, which ranges from betting options through to availability. As mentioned above, the range of bets are the first thing that will impress when joining a live dealer online casino. Best from as little as £1 can be placed on any game and huge limits can be reached. These developers have included multiple chip values, allowing players to access unique bet values as well. This allows you to wager the exact amount you want and achieve the winnings you desire. The games offered at live dealer casinos include many seats and those with limited seating simply include more tables for players to enjoy. This means no matter the time of day or night, you will always have a seat at any of the live dealer games you choose. Once a table is full, the casino simply adds another table with a new dealer to provide the same exciting game opportunity. These games are now also available on mobile casinos, which can be accessed with any iOS or Android device. This includes both tablets and smartphones. The layout for these games are somewhat different, and most include virtual betting, which pops up during betting times. However, while the game is played, you will be able to see the dealer and the results of the game. This feature is very new to the online casino world, making it exciting and worth trying. Players are offered the same option in regards to bet values, game options, and much more. The first thing you would need to do is find an online casino that provides live dealer games, which is relatively easy. Once you’ve created an account and made a deposit, you can click on the live casino tab and choose from the game selection offered. For example, we will use Roulette and Blackjack, which are sure to give you the best possible breakdown of how these games work and the options you have. Once the game has loaded, it will present a window on your screen where you will see the dealer and all the betting options at the bottom of your screen. All these games also offer a live chat option, which can be seen by other players and the dealer. Players will also see stat buttons, which present pop-up windows where you can see the history, hot and cold numbers, and much more. If a game is in progress, you would need to wait for the next betting round to open, which only takes a few seconds. Once the dealer calls “place your bets,” you can choose from the various chip values at the bottom of the screen and place them anywhere on the Roulette table. These games provide all the betting options found in regular casino tables. Simply move your mouse to where you would like to place the bet, and click. You can put as many chips on the table as you’d like. To stack chips, simply click on the same position again. Most games provide a timer while betting so you can see how much time you have left. The dealer will also call no more betting once the time has run out and your view will change to one that shows the wheel. This allows you to see the results take place in the game, which will also be pointed by virtually by the game itself. Rewards will then be paid instantly, and the next betting round will open. Players can use multiple options such as re-bet, double-up, and much more to make the next betting rounds faster and easier. Blackjack will also require an account and a deposit when joining a new casino. Players can access the game in the live casino section as well, which would also present a window with the live dealer and the table. However, here you won’t have multiple camera angles as most developers feature the whole table and the dealer with a single camera. Once again, the same range of betting options will be featured, and players can access a history as well, which tells you how often the dealer has won. Most Blackjack games have been created with virtual betting tables, meaning you place your bet on the table. In most cases, the betting time is less with Blackjack as there are aren’t multiple betting options as found with Roulette. However, the time period is still more than enough to reach any bet amount you desire by using a mix of chips. Once the betting time is over, the dealer will present cards on the table to each position. Most tables offer 5 positions at a time, which is the same as you would find in land-based casinos. The dealer will start offering the options to the first player on their left, which includes stand, hit, double down, and split. Players can also pre-select these choices, making the game faster. Your time to select an option is also limited, which ensures the game keeps moving at a steady pace. The common draw variation of Blackjack works the same as the above, but instead of offering each player the options on different hands, all the players will vote for the best move on a single hand. On the left, you will find a bar with all the options and the votes. The option with the most votes would be selected, which can include hit, stand, double-down, and split. This is a very exciting way of playing Blackjack, which can also include strategies such as progressive betting. Live dealer casino games are much more exciting than virtual betting games and land-based casino games as these live dealers provide the best of both. Players will access the easy to use and fast pace of virtual gaming while also having the fairness and gaming options of a land-based table game. All the dealers are highly professional and provide a unique opportunity for all to benefit from. There are also a few casinos that offer promotions for live dealer games, giving you additional cash to wager higher in the games and reach bigger winnings.